The Ionian Sea (Greek: Ιόνιο Πέλαγος, Iónio Pélagos [iˈonio ˈpelaɣos]; Italian: Mar Ionio [mar ˈjɔːnjo]; Albanian: Deti Jon [dɛti jɔ:n]) is an elongated bay of the Mediterranean Sea, south of the Adriatic Sea. It is bounded by Southern Italy including Calabria, Sicily, and the Salento peninsula to the west, southern Albania to the north, and the west coast of Greece. All major islands in the sea belong to Greece. They are collectively named the Ionian Islands, the main ones being Corfu, Kefalonia, Zakynthos, Lefkada, and Ithaca. There are ferry routes between Patras and Igoumenitsa, Greece, and Brindisi and Ancona, Italy, that cross the east and north of the Ionian Sea, and from Piraeus westward. Calypso Deep, the deepest point in the Mediterranean at −5,267 m (−17,280 ft), is located in the Ionian Sea, at 36°34′N 21°8′E﻿ / ﻿36.567°N 21.133°E﻿ / 36.567; 21.133. The sea is one of the most seismically active areas in the world. Boundaries of the Ionian Sea. Red lines define the I.H.O. border. The name Ionian comes from the Greek language Ἰόνιον (πέλαγος). Its etymology is unknown. Ancient Greek writers, especially Aeschylus, linked it to the myth of Io. In Ancient Greek the adjective Ionios (Ἰόνιος) was used as an epithet for the sea because Io swam across it. According to the Oxford Classical Dictionary, the name may derive from Ionians who sailed to the West. There were also narratives about other eponymic legendary figures; according to one version, Ionius was a son of Adrias (eponymic for the Adriatic Sea); according to another, Ionius was a son of Dyrrhachus. When Dyrrhachus was attacked by his own brothers, Heracles, who was passing through the area, came to his aid, but in the fight the hero killed his ally's son by mistake. The body was cast into the water, and thereafter was called the Ionian Sea. On the North. A line running from the mouth of the Butrinto River (39°44'N) in Albania, to Cape Karagol in Corfu (39°45'N), along the North Coast of Corfu to Cape Kephali (39°45'N) and from thence to Cape Santa Maria di Leuca in Italy. On the East. From the mouth of the Butrinto River in Albania down the coast of the mainland to Cape Matapan. On the South. A line from Cape Matapan to Cape Passero, the Southern point of Sicily. On the West. The East coast of Sicily and the Southeast coast of Italy to Cape Santa Maria di Leuca. 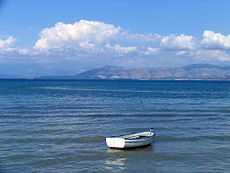 Wikimedia Commons has media related to Ionian Sea. ^ Gade, Martin (March 15, 2008). "The European Marginal and Enclosed Seas: An Overview". In Barale, Vittorio (ed.). Remote Sensing of the European Seas. Springer Science+Business Media. pp. 3–22. ISBN 978-1-4020-6771-6. LCCN 2007942178. Retrieved August 28, 2009. ^ "NCMR - MAP". National Observatory of Athens. Archived from the original on August 28, 2009. Retrieved April 5, 2018. ^ Babiniotis, Lexiko tis Neoellinikis Glossas. ^ Jakub Pigoń (18 December 2008). The Children of Herodotus: Greek and Roman Historiography and Related Genres. Cambridge Scholars Publishing. p. 114. ISBN 978-1-4438-0251-2. ^ LSJ, A Greek-English Lexicon s.v. Ἰόνιος. ^ John Freely (30 April 2008). The Ionian Islands: Corfu, Cephalonia and Beyond. I.B.Tauris. p. 10. ISBN 978-0-85771-828-0. ^ John Keahey (15 July 2014). A Sweet and Glorious Land: Revisiting the Ionian Sea. St. Martin's Press. p. 116. ISBN 978-1-4668-7603-3. ^ Charles Anthon (1869). A Classical Dictionary Containing an Account of the Principal Proper Names Mentioned in Ancient Authors [and Intended to Elucidate All the Important Points Connected with the Geography, History, Biography, Mythology, and Fine Arts of the Greeks and Romans: Together with an Account of Coins, Weights, and Measures, with Tabular Values of the Same.]. Harper [& Brothers]. p. 679. ^ a b Gocha R. Tsetskhladze (2008). Greek Colonisation: An Account of Greek Colonies and Other Settlements Overseas. BRILL. p. 157. ISBN 90-04-15576-7. ^ Limits of Oceans and Seas (PDF) (3rd ed.). Organisation hydrographique internationale. 1953. Retrieved February 7, 2010. This page was last edited on 19 March 2019, at 23:54 (UTC).